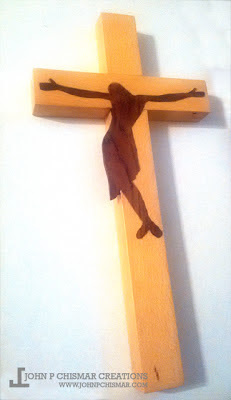 This weekend I completed a wall mounted crucifix for my mother. The cross is beech wood recovered from a fallen tree while on a hike. The Christ is from a piece of rosewood I have around the shop. The Christ was outlined on the cross in order to create a 1/8” deep indentation to receive the inlaid Christ. 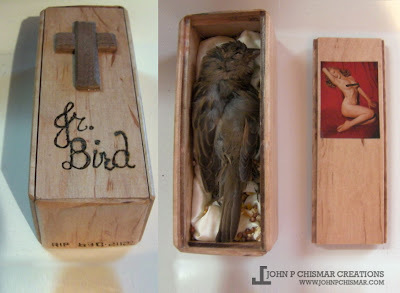 Today we remember the one year anniversary of the death of Jr. Bird. We found this little guy not feeling well in our yard. We made a little bed with food and shade but he was ready to move on.We made a coffin, had a little ceremony and laid him to rest in our backyard garden. R.I.P. Jr. Bird. R.I.P.